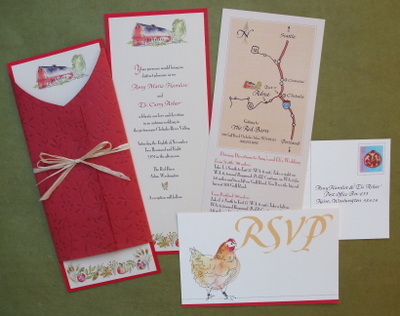 What better way to begin my new site than to post a recently completed labor of love: a wedding invitation package for my son Eli and his extraordinary fiancee, Amy. For those interested in the materials used, the raffia-colored stock is Eames Furniture Weave, the red cardstock is Esse Texture, and the postcard stock is Classic Crest Cream. The handmade, embossed paper for the jacket is from Shizen Design. All materials were purchased at Paper Zone. The technical part: illustrations were done in layers, one for the pen & ink drawings, and one for the watercolor washes. They were put together in PhotoShop, and later placed into inDesign documents. The calligraphy was done the old fashioned way, with pen & ink. This artwork was scanned, the RSVP colorized in PhotoShop, and also placed in the inDesign documents. My trusty Lexmark laser printer produced the final prints. What about that fine hen, Lucky? To see her "in person" click on this thumbnail photo. She is Eli's and Amy's inherited lady who was abandoned when the previous owners of their 10 acre farm left the property. She survived on her own there for 9 months, avoiding certain death by Great Horned Owl, brown bears, weasels and a host of other hungry inhabitants of their property. Now she is living with eleven other hens and one happily busy rooster ("she" was supposed to be an Americana hen), two goats, two cats, and Stella the yellow lab puppy. It's a lively place! The farm is in Castle Rock, Washington.